Waking up in the morning never felt so fabulous before. I had tried reading up whatever little the internet had to offer about these places I was about to visit today, and I couldn’t wait to see it for myself. As we approached the village, we saw that the houses were built much lower in the valley and the road itself led us to an enormous statue of the meditating Buddha, facing the snow peaked mountains. Standing beside that statue, the wind flowing through my hair, sun on my face, milky-white Mountaintops before my eyes, it was an experience so invigorating, I simply cannot explain except by saying that you’ve got to be there to feel it. There were 2 teenaged siblings sitting beside the statue, selling some homemade tea from their flask and some fossils they had collected from the nearby rocks. The village is well known for their fossils, deciphering the mystery of the Himalayan creation. For those interested, one can stay longer in this village to go fossil hunting. There are a handful of locals who’ve opened up their homes for travellers as homestays. It has now become one of their sources of income during the summer months. Another 8 Km away was Komic, the highest village in the world connected with a motorable road. This small village is located at a height of 4587 meters above sea level inhabited by just 114 people. There is an 800-year-old monastery here with 2 red buildings built apart. One of them houses monks while the other one was closed. We walked around the place and found the view from behind the monastery to be spectacular. There were a few grazing Dzos and Dzomos on the grassy areas. They are sometimes also called Yattle or Yakow, being a hybrid of Yak and domestic cattle. These mountains are also homes to Blue Sheep, Ibex and Snow Leopard which are sometimes spotted during commute if you’re lucky. Hikkim is located just 2 Km from Komic at an altitude of 4400 meters. It is the world’s highest polling station recorded in the Limca book of records and also has the world’s highest post office. Having bought a few postcards from Kaza, we walked into the post office just in time before it closed for lunch. There was a frail old postmaster who had become sort of a celebrity inside his dark and dingy post office with swarming tourists lounging around anything that remotely resembled a seat. Some of them were cherry-picking postcards from his collection while others were writing longwinded letters to post to themselves. The postmaster was very cheerfully thumping his rubber stamp on any postcard or envelope given to him, with or without a stamp (the office ran out of stamps and he was being kind). After clicking a few pictures in front of the post office, we climbed back on to our vehicle and headed back to Kaza. That was a lot of “Firsts” I had experienced in a single day! How could I not etch this day into my memory? Hikkim post office, World’s highest post office. • Visit the Buddha statue. • Trek to the lake. • Stay overnight to experience their unique village life. • Star gazing at night. 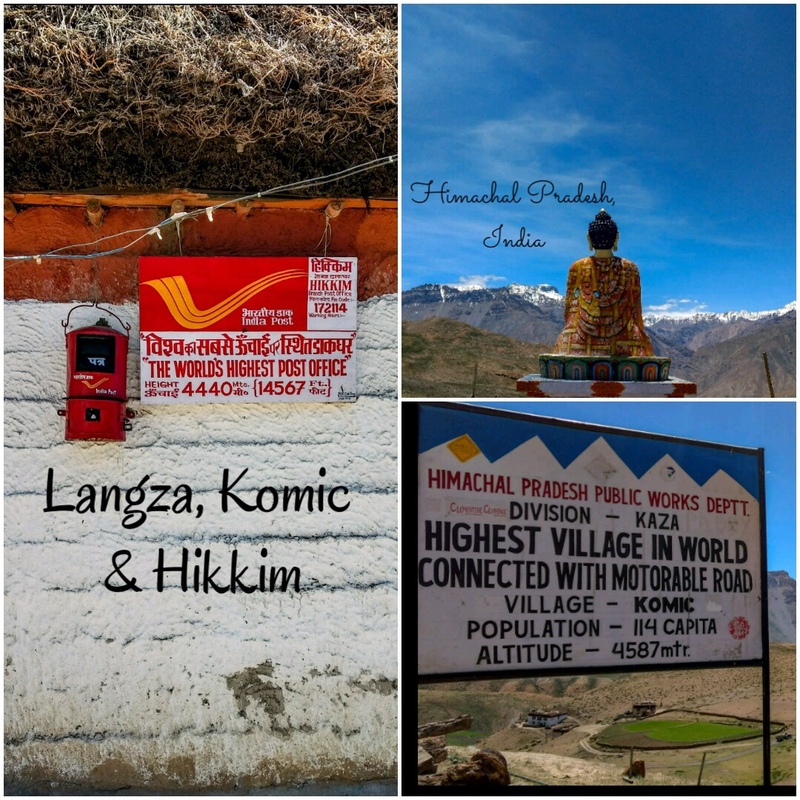 • Experience a “first” by standing on the highest village in the world with a motorable road. • Short nature walks amongst the Dzos. • Visit the world’s highest post office. • Post yourself/friends/family a post card from here. Sometimes they are out of postcards and stamps. You can buy them from Kaza before you leave. • Walk through the village roads to understand their unique life. • The only way to get here is a private vehicle or the local bus that runs from Kaza twice weekly on Tuesdays and Saturdays. • There’s no mobile network AT ALL except for BSNL connections that work only in Kaza. • We didn’t find any place to eat here, so we had our breakfast and lunch in Kaza before and after our trip respectively. • For those who decide to stay in the homestays, there is homely food available while you stay. • Don’t forget to carry water with you here. I have been wanting to do the Spiti valley for a while now. Loved reading your posts on it. Any recommendations on who could help me organise my trip? I like to travel solo. 🙂 Thanks in advance. I went with a small group of friends and https://www.spitiholidayadventure.com/ organised my trip. I think they organise solo trips as well. They made it very convenient for us. Happy to help! Enjoy your trip!